They're providing assistance to families of federal employees who aren't getting paid during the shutdown. Food pantries across Maine are stepping up to provide assistance to families whose members have been furloughed by the partial shutdown of the federal government and are struggling to make ends meet. Augusta Food Bank volunteer Eleanor Kidwell packs items for customers Tuesday. The impact of the shutdown hit Maine hard on Tuesday after the commandant of U.S. Coast Guard, Adm. Karl L. Schultz, announced in an open letter to enlisted personnel that Coast Guardsmen and women will not be receiving their midmonth paychecks. The paychecks were due to be issued on Tuesday, but Schultz said there is no indication as to when or if enlisted personnel will be compensated. Maine is home to hundreds of families supported by active-duty Coast Guard members. They are responsible for patrolling and responding to emergencies along Maine’s 3,500 miles of coastline. In Maine, the shutdown has caught the attention of several food pantries – including in the Portland, Saco, Augusta, Lewiston and Rockland areas – that say they want to help families whose loved ones are making a sacrifice for their country. 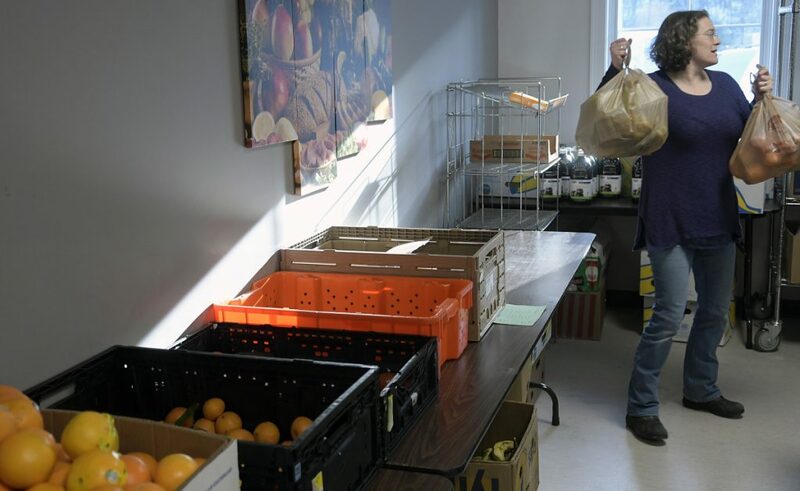 Alex Eisman, spokeswoman for the Stroudwater Food Pantry in Portland, said any federal worker affected by the shutdown is welcome to come to the facility on Westbrook Street from 1-3 p.m. Sunday to receive food. “All they need to do is show any form of ID and they can become a pantry client,” Eisman said. In Rockland, the Area Interfaith Outreach Pantry is also urging government workers to come in for food assistance. “The AIO Food Pantry and Emergency Assistance invites any government employee in Knox County affected by the shutdown who needs food for your family, or heating assistance for your home, to come to the food pantry at 70 Thomaston Street,” the pantry said in a post on its Facebook page. And Maine’s largest food bank, Good Shepherd Food Bank in Auburn, issued a statement Tuesday reminding furloughed government workers that food is available if they are having difficulty paying for groceries because of other bills coming due. Augusta Food Bank volunteer Ilana Gilg bags fruit for recipients Tuesday. “If you or someone you know is impacted by the current government shutdown, and could use some help finding a local food resource, our partner agencies are ready to help,” Good Shepherd said in a post on its Facebook page. The Augusta Food Bank is offering food to families affected by the shutdown – regardless of where they live or how much money they normally make – to help them cope with not receiving their paychecks. 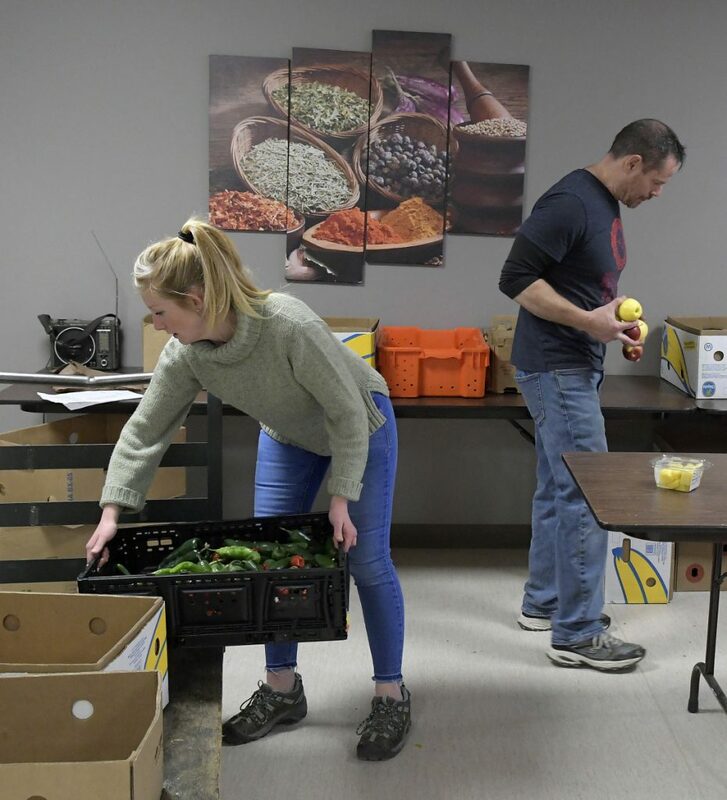 “When it became apparent this shutdown would linger on longer than those in the past, we wanted to try to find a way to help,” said Al Smith, executive director of the nonprofit, which normally provides food to Augusta and Manchester residents in need. Federal workers just need to bring their government IDs with them to prove they are a government worker who is furloughed. They can call 622-5225 to make arrangements. JoEllen Cottrell, executive director of Winthrop Food Pantry, which serves residents of Winthrop and Wayne, said the pantry will provide free food to unpaid federal workers in that area. She said other food banks and pantries, including the Vassalboro Food Station Pantry, are also offering federal workers in their service areas food. “Food pantries are happy to help,” Cottrell said. The pantry in Winthrop is open from 1 to 2:30 p.m. Thursday and from 5 to 6:30 p.m. the second and fourth Thursday of the month. It can be reached at 377-3332. Free items and assistance other than food are also available in central Maine to federal workers missing out on their pay. People, regardless of what their income is normally, are welcome at Bridging the Gap, a nonprofit group that oversees Everyday Basics Essentials Pantry, Addie’s Attic Clothing Bank, and the Augusta Community Warming Center, according to Sarah Miller, executive director. While most federal workers probably haven’t gone without pay long enough to need to get new or used clothes, the essentials pantry offers toiletries, including hygiene products, diapers and bathroom supplies free of charge to people who need them. People are welcome to come pick up items when the services are open. Federal workers in need of something active to blow off steam, or who want to treat their kids to a fun time, also have a free option offered by a local business. “Think about it. These folks are public servants, and what’s happening right now is wrong,” said Brian Plavnick, an owner of the business. Last week the Maine Department of Education emailed a reminder to school districts that applications for free and reduced-price meals may be submitted any time of the school year, and if federal employees affected by the shutdown would like to apply for school meal benefits for their children, they may do so through their local school district. A special application can be downloaded from the Maine Department of Education’s website and submitted to local school food services. More videos: As Westbrook’s ice disk turns, scientists wonder: why?